Limited to 5 sets world wide Available for immediate shipping. costumed for "Ladies in White". Also included is the tall ornately carved Victorian chair and the Battenberg pillow. 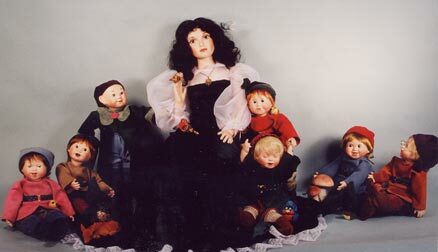 This set is $3,250.00 + s/h Snow White and all seven of the baby dwarfs are individually sculpted . Snow White is 30 " tall the each dwarf is 13" tall. One of these sets is now displayed in a museum in Israel. 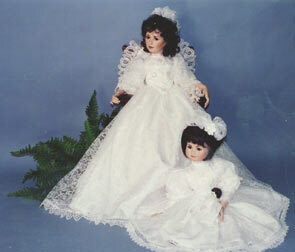 Contact Linda for separate dolls.